This chapter describes how to configure and deploy Coherence*Web, the session state persistence and management module, for use with WebLogic Server. The functionality that allows Coherence*Web to be used with this application server is contained in the Coherence*Web. This chapter also provides an overview of Managed Coherence Servers and Grid Archive (GAR) format for packaging Coherence applications for the grid. A detailed discussion of Managed Coherence Servers and the GAR format is beyond the scope of this document. For more information, see Oracle Fusion Middleware Developing Oracle Coherence Applications for Oracle WebLogic Server. The classes that define the Coherence*Web are contained in the coherence-web.jar file. To use the functionality provided by Coherence*Web, the coherence.jar classes must also be available to the Web application. Both of these files can be found in the coherence\lib directory. In WebLogic Server 12c (12.1.3) and later, the coherence-web.jar and the coherence.jar files appear on the WebLogic Server system classpath. The coherence-web.jar will load application classes with the appropriate classloader in WebLogic Server. This means that you do not have to include the coherence.jar or coherence-web.jar files in the web application's classpath. WebLogic Server and Coherence must be on the same versions when using Coherence*Web. Coherence cache configurations and services used by Coherence*Web are defined in the default-session-cache-config.xml file, which can be found in the coherence-web.jar file. The default cache and services configuration defined in the default-session-cache-config.xml file should satisfy most Web applications. You can create your own custom session cache configuration by packaging a file named session-cache-config.xml in your Web application. For more information see, "Using a Custom Session Cache Configuration File". When Coherence*Web is started on WebLogic Server, it first looks for a file named session-cache-config.xml. For example, the file can be placed in a WAR file's WEB-INF/classes directory, or packaged in a JAR file and placed in an EAR file's APP-INF/lib directory. If no custom session cache configuration XML resource is found, then it will use the default-session-cache-config.xml file packaged in coherence-web.jar. Coherence*Web for WebLogic Server is configured with local-storage disabled. The server will serve requests and will not be used to host data. This means a Coherence cache server must be running in its own JVM, separate from the JVM running WebLogic Server. The timeout for requests to the cache server to respond is 30 seconds. If a request to the cache server has not responded in 30 seconds, a com.tangosol.net.RequestTimeoutException exception is thrown. All Coherence*Web-enabled applications running on the 12c (12.1.3) release of WebLogic Server have application server-scope. In this configuration, all deployed applications become part of one Coherence node. See "Cluster Node Isolation" for more information about cluster node scope. Coherence*Web provides several session locking modes to control concurrent access of sessions. Both Coherence*Web employs Last Write Wins locking by default. See "Session Locking Modes" for more information about locking modes. Coherence applications can be deployed in a manner similar to other Java EE applications. Coherence applications in the grid can be managed by using WebLogic Server Console and WLST. Coherence clusters can be configured by using WebLogic configuration. Coherence Grid Archives can be integrated into Enterprise Archives (EAR files). Coherence applications can integrate with existing Coherence-based functionality. Using multiple Coherence clusters in a single WebLogic Server domain is not recommended. For more information on Managed Coherence Servers, see "Creating Coherence Applications for WebLogic Server" in Oracle Fusion Middleware Developing Oracle Coherence Applications for Oracle WebLogic Server. Install WebLogic Server and Oracle Coherence. See "Installing WebLogic Server and Oracle Coherence". (Optional) Modify the web.xml file in the deployment if your application requires advanced configuration for Coherence*Web. "Configure Coherence*Web" describes the parameters that can be configured for Web applications. The entire set of Coherence*Web parameters are described in Appendix A, "Coherence*Web Context Parameters." (Optional) Configure the WebLogic-generated HTTP session cookie parameters in the weblogic.xml or weblogic-application.xml file. See "Configure the Session Cookies". (Optional for testing; strongly suggested for production) Start a Cache Server Tier in a separate JVM from the one running WebLogic Server. See "Start a Cache Server". Set the Coherence*Web storage mode. See "Configure Coherence*Web Storage Mode". Deploy the application to WebLogic Server. See "Deploying Applications to WebLogic Server". WebLogic Server is installed by executing the fmw_version_wls.jar. This installer provides the full install and allows you to individually select the components to install (bits, examples, Javadoc). The installer supports both a graphical mode using the Oracle Universal Installer (OUI) and a silent mode. Installing Coherence is an option in the WebLogic Server installer. WebLogic Server is always installed to the ORACLE_HOME/wlserver directory; Coherence is always installed to the ORACLE_HOME/coherence directory. For detailed instructions on installing WebLogic Server, see Installing Oracle WebLogic Server. Coherence*Web provides a default configuration that should satisfy most Web applications. Table 2-1 describes the context parameters configured by Coherence*Web. Table 2-2 describes the compatibility mode context parameter. For complete descriptions of all Coherence*Web parameters, see Appendix A, "Coherence*Web Context Parameters." If both a system property and the equivalent context parameter are configured, the value from the system property is used. The application name is the name of the application that uses the ApplicationScopeController interface and Web module name is the name of the Web module in which it appears. For example, if you have an EAR file named test.ear and a Web-module named app1 defined in the EAR file, then the default value for the coherence-application-name parameter would be test!app1. If this parameter is not configured, then Coherence*Web uses the name of the class loader instead. Also, if the parameter is not configured and the ApplicationScopeController interface is configured, then a warning is logged saying that the application name was not configured. See "Session Attribute Scoping" for more information. This setting allows the session reaper to assume that the sessions that are stored on this node (for example, by a distributed cache service) are the only sessions that this node must check for expiration. This value specifies the class name of the optional com.tangosol.coherence.servlet.HttpSessionCollection$AttributeScopeController interface implementation. The default set by Coherence*Web is com.tangosol.coherence.servlet.AbstractHttpSessionCollection$ApplicationScopeController. Table 2-2 describes the coherence-session-weblogic-compatibility-mode context parameter which is specifically provided by Coherence*Web. This parameter is provided by Coherence*Web. If its value is set to true, it determines that a single session ID (with the cookie path set to "/") will map to a unique Coherence*Web session instance in each Web application. If it is false, then the standard behavior will apply: a single session ID will map to a single session instance using Coherence*Web in WebLogic Server. All other session persistence mechanisms in WebLogic use a single session ID in each Web application to refer to different session instances. This parameter defaults to true unless the global scope controller is specified. If this controller is specified, then the parameter defaults to false. Table 2-3 describes the coherence-factory-class context parameter. The default value, which is set by Coherence*Web, should not be changed. The fully qualified name of the class that implements the SessionHelper.Factory factory class. Coherence*Web sets the default value to weblogic.servlet.internal.session.WebLogicSPIFactory. This value should not be changed. If you are using Coherence*Web, then WebLogic Server generates and parses the session cookie. In this case, any native Coherence*Web session cookie configuration parameters will be ignored. To configure the session cookies, use the WebLogic-generated HTTP session cookie parameters in the weblogic.xml or weblogic-application.xml files. Table 2-4 describes these parameters. In this table, Updatable? indicates whether the value of the parameter can be changed while the server is running. Not applicable indicates that there is no corresponding Coherence session cookie parameter. Specifies the comment that identifies the session tracking cookie in the cookie file. Specifies the domain for which the cookie is valid. For example, setting cookie-domain to.mydomain.com returns cookies to any server in the *.mydomain.com domain. The domain name must have at least two components. Setting a name to *.com or *.net is not valid. If not set, this attribute defaults to the server that issued the cookie. For more information, see Cookie.setDomain() in the Servlet specification. Sets the life span of the session cookie, in seconds, after which it expires on the client. For more information about cookies, see "Using Sessions and Session Persistence" in Developing Web Applications, Servlets, and JSPs for Oracle WebLogic Server. The default value is -1 (unlimited). Defines the session-tracking cookie name. Defaults to JSESSIONID if not set. You can set this to a more specific name for your application. Defines the session-tracking cookie path. If not set, this attribute defaults to a slash ("/") where the browser sends cookies to all URLs served by WebLogic Server. You can set the path to a narrower mapping, to limit the request URLs to which the browser sends cookies. Tells the browser that the cookie can be returned only over an HTTPS connection. This ensures that the cookie ID is secure and should be used only on Web sites that use HTTPS. Session cookies sent over HTTP will not work if this feature is enabled. Disable the url-rewriting-enabled element if you intend to use this feature. WebLogic Server generates the session cookie. Enables use of session cookies by default and is recommended, but you can disable them by setting this property to false. You might turn this option off for testing purposes. Enables the debugging feature for HTTP sessions. Support it by enabling HttpSessionDebug logging and the WebLogic Server trace logger. Is set to true if the latest servlet specification requires containers to encode the session ID in path parameters. Certain Web servers do not work well with path parameters. In such cases, the encode-session-id-in-query-params element should be set to true. WebLogic Server generates the HTTP response. Sets the size of the session ID. The minimum value is 8 bytes and the maximum value is Integer.MAX_VALUE. If you are writing a Wireless Application Protocol (WAP) application, you must use URL rewriting because the WAP protocol does not support cookies. Also, some WAP devices have a 128-character limit on URL length (including attributes), which limits the amount of data that can be transmitted using URL rewriting. To allow more space for attributes, use this attribute to limit the size of the session ID that is randomly generated by WebLogic Server. You can also limit the length to a fixed 52 characters, and disallow special characters, by setting the WAPEnabled attribute. For more information, see "URL Rewriting and Wireless Access Protocol" in Developing Web Applications for WebLogic Server. Sets the time, in seconds, that Coherence*Web waits between checks for timed-out and invalid sessions, and deleting the old sessions and freeing up memory. Use this element to tune WebLogic Server for best performance on high traffic sites. Sets the time, in seconds, that Coherence*Web waits before timing out a session. On busy sites, you can tune your application by adjusting the timeout of sessions. While you want to give a browser client every opportunity to finish a session, you do not want to tie up the server needlessly if the user has left the site or otherwise abandoned the session. This element can be overridden by the session-timeout element (defined in minutes) in web.xml. The default is 3600 seconds. Enables session tracking between HTTP requests. A Coherence cache server is responsible for storing and managing all cached data. Coherence is integrated within WebLogic Server as a container subsystem. The use of a container aligns the lifecycle of a Coherence cluster member with the lifecycle of a managed server: starting or stopping a managed server JVM starts and stops a Coherence cluster member. Managed servers that are cluster members are referred to as managed Coherence servers. Coherence clusters are different than WebLogic Server clusters. They use different clustering protocols and are configured separately. Multiple WebLogic Server clusters can be associated with a Coherence cluster and a WebLogic Server domain can contain only a single Coherence cluster. Managed servers that are configured as Coherence cluster members are referred to as managed Coherence servers. Managed Coherence servers can be explicitly associated with a Coherence cluster or they can be associated with a WebLogic Server cluster that is associated with a Coherence cluster. WebLogic Server-managed servers that are members of a Coherence cluster and are storage-enabled, act as cache servers. For more information on Coherence clusters in a WebLogic server environment, see "Configuring and Managing Coherence Clusters" in Administering Clusters for Oracle WebLogic Server. For more information on Coherence applications in a WebLogic Server environment, see Oracle Fusion Middleware Developing Oracle Coherence Applications for Oracle WebLogic Server. You can start a Coherence cache server or cluster either from the WebLogic Server Administration Console or from the command line, as described in the following sections. Using the WebLogic Server Administration Console, you can enable storage for each WebLogic Server that is a member of a Coherence cluster. The Coherence session caches have a separate flag for enabling storage. For more information on this flag, see "Enabling the Coherence Session Cache in Weblogic Server Administration Console". If your managed server is a member of a Coherence cluster and is using Coherence*Web, then you can enable session storage by adding the -Dtangosol.coherence.session.localstorage=true system property to the startup command. Coherence session caches automatically start with the WebLogic Server cluster. For an example of working with Coherence cache servers in the WebLogic Server Administration Console, see "Caching Sessions with Managed Coherence Servers" in Oracle Fusion Middleware Tutorial for Oracle Coherence. The following steps summarize how to start a Coherence cluster in the WebLogic Server Administration Console. For detailed information, see "Configuring and Managing Coherence Clusters" in Administering Clusters for Oracle WebLogic Server. Configure WebLogic Servers and clusters that will be associated with the Coherence cluster. Enable Coherence*Web for the selected WebLogic Servers or clusters. For detailed information, see "Enabling the Coherence Session Cache in Weblogic Server Administration Console". Instead of using the WebLogic Server Administration Console, there may be situations when you might need to start a Coherence cache server or cluster from the command line. You can start the Coherence cache server from the command line either in standalone mode, or as part of a WebLogic Server instance. Create a script for starting a Coherence cache server. The following is a simple example of a script that creates and starts a storage-enabled cache server. This example assumes that you are using a Sun JVM. See "JVM Tuning" in Oracle Fusion Middleware Developing Applications with Oracle Coherence for more information. You must include coherence-web.jar and coherence.jar on the classpath. The variable session_cache_configuration_file represents the absolute path to the cache configuration file on your file system. For Coherence*Web, the default session cache configuration file is named default-session-cache-config.xml. Note that the cache configuration defined for the cache server must match the cache configuration defined for the application servers which run on the same Coherence cluster. If your application uses additional Coherence caches, then you must merge the cache configuration information with a customized session cache configuration file. This customized session cache configuration file, typically named session-cache-config.xml, should contain the contents of default-session-cache-config.xml file and the additional caches used by your application. The cache and session configuration must be consistent across WebLogic Server and Coherence cache servers. For more information on merging these files, see "Merging Coherence Cache and Session Information" in Oracle Fusion Middleware Integrating Oracle Coherence. The variable Coherence_cluster_name represents the name of the Coherence cluster. A cluster name check has been added to 10.3.6 and later versions of WebLogic Server. The tangosol.coherence.cluster property must be added to the cache server because you are declaring the cluster name in the WebLogic Server application. If the Coherence servers are started in standalone mode, they must pass this property, otherwise the cluster will not form between the WLS servers and the standalone cache server. Start one or more Coherence cache servers using the script described in the previous step. Create a script for starting a Coherence cache server. This can be similar to the script described in the previous section. Include the command-line property to enable local storage, -Dtangosol.coherence.session.localstorage=true, in the server startup command. The WebLogic Server instance will start with Coherence*Web-enabled and local storage enabled. To start a Coherence*Web-enabled WebLogic Server instance, omit this system property. Local storage will be disabled by default. For more information about working with WebLogic Server through the command line, see "weblogic.Server Command-Line Reference" in Oracle Fusion Middleware Command Reference for Oracle WebLogic Server. You can enable Coherence*Web session storage by specifying coherence-web as the value of the persistent-store-type attribute in the weblogic.xml session configuration. This configuration provides application server-level cluster node scoping for web applications deployed on WebLogic Server. No shared libraries need to be deployed or depended upon. Coherence*Web is initialized only when a web application that requires session persistence is started in the WebLogic Server instance. Example 2-1 illustrates a sample weblogic.xml file where coherence-web is the value of the persistent-store-type attribute. If you are using the default session cache configuration file with your web application, then you can package and deploy it like any other Java EE application. However, if you are using a custom session cache configuration file, then you must package and deploy the application in a GAR file. GAR files deploy like any other Java EE application, except that you create a Coherence tier and nodes belonging to the tier. You can configure and deploy a standalone GAR or an embedded GAR. For information about configuring and deploying standalone GAR files and embedded GAR files, see "Deploying Coherence Applications to WebLogic Server" in Oracle Fusion Middleware Administering Oracle Coherence and "Creating Coherence Applications for WebLogic Server" in Developing Oracle Coherence Applications for Oracle WebLogic Server. WebLogic Server defines a cluster MBean (weblogic.management.configuration.ClusterMBean) which represents a cluster in the domain. The cluster MBean defines a number of attributes, operations, and MBeans related to the management of the cluster. Among the MBeans defined by the cluster MBean are the CoherenceMemberConfigMBean and the CoherenceTierMBean MBeans. The CoherenceMemberConfigMBean and the CoherenceTierMBean MBeans each define an isCoherenceWebLocalStorageEnabled attribute that indicates whether a cluster or member is acting as a storage tier for Coherence*Web. This attribute is defined in Table 2-5. If this attribute is set to true in CoherenceTierMBean, it indicates that a cluster is acting as a storage tier for Coherence*Web. Coherence*Web cache services will start with storage enabled when the server starts. When deploying a Coherence*Web-enabled application, there must be a running WebLogic cluster in the domain which has this attribute enabled. If this attribute is set to true in CoherenceMemberConfigMBean, it indicates that this node is acting as a storage node for Coherence*Web. Coherence*Web cache services will start with storage enabled when the server starts. When deploying a Coherence*Web-enabled application, there must be a running WebLogic cluster in the domain which has this attribute enabled. Select Environment, then Clusters in the Domain Structure Window. Select a defined cluster in the Clusters table. Select Configuration tab then the Coherence tab in the Settings for cluster page. Figure 2-1 illustrates the Coherence Web Local Storage Enabled checkbox in the WebLogic Server Administration Console Settings for cluster page. Description of "Figure 2-1 Coherence Web Local Storage Enabled Checkbox"
The coherence-web.jar file contains a default-session-cache-config.xml cache configuration file which should be sufficient for most applications. However, if you are working with technologies such as Coherence*Extend or Push Replication, or if you have WebLogic Server nodes that are to act as storage-enabled cache servers with a custom session cache configuration, then you must provide a custom session cache configuration file. Custom session cache configuration files must be packaged in a GAR file for deployment. Note that you can customize the session cache configuration file name, but then you must provide the new file name as the value of the coherence-cache-configuration-path context parameter in the web.xml file. 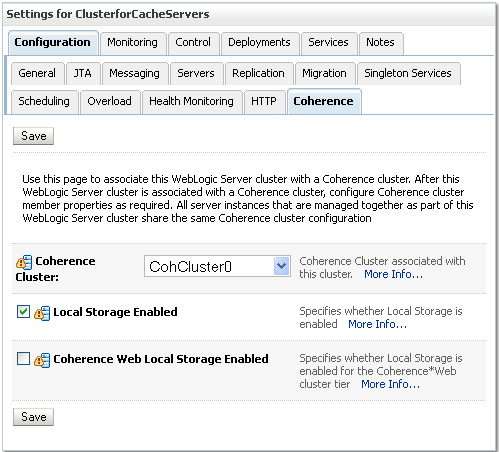 If you do not want the WebLogic Server cluster members running the Coherence*Web application to act as a cache server, then ensure that the Coherence Web Local Storage Enabled checkbox in the WebLogic Server Administration Console "Settings for cluster" page is not selected for the cluster members. This will cause the custom session cache configuration file to be read. For more information on the packaging requirements for a GAR file, see "Packaging Coherence Applications for WebLogic Server" in Oracle Fusion Middleware Administering Oracle Coherence and "Creating Coherence Applications for Oracle WebLogic Server" in Developing Oracle Coherence Applications for Oracle WebLogic Server. Create the custom session cache configuration file and name it session-cache-config.xml. The local-storage parameter specifies whether a cluster node contributes storage to the cluster. In WebLogic Server, the local-storage parameter does not enable storage in Coherence*Web for WebLogic Server members that have a GAR file deployed to them. Deploy the GAR file to the WebLogic Server cluster that is to act as the storage-enabled Coherence cluster members. Enable storage in the session-cache-config.xml file (see Step 1a). Enable storage in the server itself either by selecting the Coherence Web Local Storage Enabled checkbox in the WebLogic Server Administration Console or by setting the JVM argument tangosol.coherence.session.localstorage to true. For information on deploying GAR files, see "Deploying Coherence Applications To a WebLogic Server Domain" in Oracle Fusion Middleware Administering Oracle Coherence. and "Deploying Coherence Applications in WebLogic Server" in Developing Oracle Coherence Applications for Oracle WebLogic Server. WebLogic Server and Coherence*Web handle session scoping and the session lifecycle in different ways. This can impact your decision to implement a single sign-on (SSO) strategy for your applications. By default, WebLogic Server uses the same session ID in every Web application for a given client, and sets the session cookie path to a forward slash (/). This is a requirement of the WebLogic Server default thin SSO implementation, which is enabled by default. By generating a session cookie with a path of "/", clients always return the same session ID in every request to the server. In WebLogic Server, a single session ID can be mapped to multiple session objects. Each Web application will have a different session object instance even though the session ID is identical (unless session sharing is enabled). In contrast, Coherence*Web maps a session ID to a single session instance. This means that the behavior of having multiple session instances mapped to the same ID is not replicated by default if an application uses Coherence*Web. Because the session cookie is mapped to "/" by default, a single Coherence*Web session is shared across all Web applications. The default configuration in Coherence*Web is that all session attributes are scoped to a Web application. For most purposes, this single session approach is transparent. The major difference of having a single session across all Web applications is the impact of session invalidation. If Coherence*Web is enabled and you invalidate a session in one Web application, then you invalidate that session in all Web applications that use that session instance. If your Web applications do not use thin SSO, then you can avoid this issue by scoping the session cookie to the Web application path. Enable "WebLogic Server session compatibly mode". This configuration is set with the coherence-session-weblogic-compatibility-mode parameter and mirrors all of the native WebLogic Server session persistence types: memory (single-server, non-replicated), file system persistence, JDBC persistence, cookie-based session persistence, and in-memory replication (across a cluster). By default, this mode is enabled. See "Using Sessions and Session Persistence" in Developing Web Applications, Servlets, and JSPs for Oracle WebLogic Server for more information. Enable thin SSO functionality. Clients will use a single session across all Web applications. This means that the session life cycle will be inconsistent with all other session persistence types. Disable the thin SSO functionality by scoping the session cookie path to the Web application context path. This will allow the session life cycle to be consistent with all other session persistence types. One advantage of enabling thin SSO with Coherence*Web is that it will work across all Web applications that are using the same Coherence cluster for Coherence*Web. The Coherence cluster is completely independent from the WebLogic Server cluster. The thin SSO functionality can even span multiple domains by enabling cross-domain trust in the WebLogic Server security layer. When a user successfully authenticates a protected resource, the session ID is changed for security purposes. In previous releases of WebLogic Server, a new session would be created, all of the session attributes from the old session would be copied into the new session, and then the old session would be invalidated. This would trigger the session listeners (if any were registered), so session lifecycle and session attribute listeners would be executed. The current release of WebLogic Server implements the HttpServletRequest.changeSessionId method from the Java Servlet 3.1 Specification. The implementation of the changeSessionId method allows the actual session ID to be updated. This means that no session lifecycle events will be triggered and no listeners will be executed. Most users should not notice any changes in the behavior of their applications. If you are running Coherence*Web on WebLogic Server and on other application servers within a single cluster, then the session cookies created by WebLogic Server will not be decoded correctly by Coherence*Web on the other servers. This is because WebLogic Server adds a session affinity suffix to the cookie which is not part of the session ID stored in Coherence*Web. The other application servers must remove the WebLogic session affinity suffix from the session cookie value for Coherence*Web to be able to retrieve the session from the Coherence cache. To strip the WebLogic session affinity suffix from the session cookie, add the coherence-session-affinity-token context parameter to the web.xml file used in the other application servers. Set the parameter value to an exclamation point (! ), as illustrated in Example 2-2. The session affinity suffix will be removed from the session cookie when it is processed by the other application server. See Appendix A, "Coherence*Web Context Parameters" for more information on the coherence-session-affinity-token context parameter. Coherence*Web for 12.1.3 is compatible with a number of different application servers. In the case of WebLogic Server, WebLogic Server and Coherence must be on the same versions when using Coherence*Web. Weblogic Server 12.1.3 is not compatible with earlier versions of Coherence*Web. For information on the compatibility between earlier versions of Coherence*Web and WebLogic Server, see "Using Coherence*Web with WebLogic Server" in Administering HTTP Session Management with Oracle Coherence*Web (12.1.2).